We are excited to launch several updated products in March that deliver on Heat & Glo’s core values of design and innovative technologies. Look for full product launch details next month. All of these products will feature our new IntelliFire Touch control system, which is the most intuitive and advanced control system on the market, with many features and benefits that make it simple, smart and safe. SIMPLE: Most intuitive control on the market, tested by consumers and customers. SMART: Includes notifications that will inform a consumer if something is needed on their fireplace, and also provides contact information for their local dealer. SAFE: Includes key safety features built in that will indicate if the fireplace is hot after it has been turned off. New TRUE Launching Next Month! New black glass interior panel option on the 36″ and 42″ models. The black glass panels are perfect for that consumer looking for a more transitional look and the dynamic impact reflecting the fire. We showcased this product at last month’s Internationals Builders’ Show, and it stopped people in their tracks. Many thought it was a multi-sided fireplace because of all the reflection. 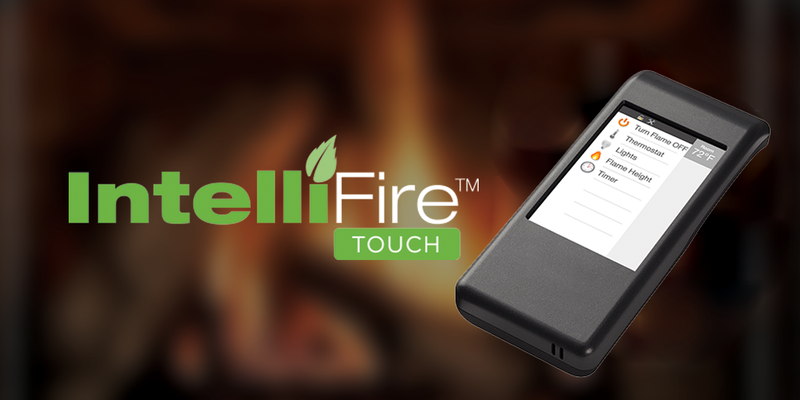 Heat Out option – this allows consumers to manage the heat of the fireplace. It will redirect 40% of the heat from the unit outside. New Multi-Sides Launching Next Month! Firescreen and Arched fronts now feature a NEW micro-screen which is virtually invisible. This is the least visible screen in the Heat & Glo line. Due to low demand, we are removing select models from our Garnet gas stove offering. Please note the following Garnet gas stove SKUs will be discontinued, effective March 31, 2017. Place your orders while supplies last – remaining inventory is limited. LTD orders of these products must ship by May 31, 2017. Please note the Garnet stove with the solitaire front in classic black (GARN-MBK-IPI-B) will remain in the Quadra-Fire line. Heirloom Series Refreshed to Include Exciting New Features! The Heirloom has always provided authentic masonry style without the costs of a site-built masonry fireplace. With the largest viewing areas in its class, the Heirloom showcases an intense fire, textured brick refractory, powerful heat and high efficiency performance. Now, key NEW features have been added to maintain a premium position in the marketplace. New reflective black glass interior panels for the 36″, 42″ models. These panels multiply the flames and intensify the fire for a more dramatic fireplace experience. Heat Out option available, which allows consumers to manage the heat of the fireplace, directing 40% of the heat from the unit outside. With this refresh, the Castlewood refractory will be discontinued due to low sales and is being replaced with reflective black glass interior panels as your upgrade opportunity to standard refractory, effective 2/24/17. Multi-Sided Series Refreshed to Include Exciting New Features! The Heatilator gas multi-sided series adds architectural interest to every home, offering dramatic two- and three-sided viewing of the fire. The design possibilities for dividing a space are made easy. Now, key NEW features for this series have been added to maintain our competitive position in the marketplace. New reflective black glass interior panels. These panels multiply the flames and intensify the fire for a more dramatic fireplace experience (Peninsula, See-Through only). Multi-Sided Series Refreshed to Include Exciting New Features!